Eats n Feats: Road Food Again - Sorta! Road Food Again - Sorta! Yesterday we took a day trip to Jackson, WY, through the Grand Tetons. Jackson is a ski resort town sort of a cross between Santa Fe, NM and Whislter, BC. 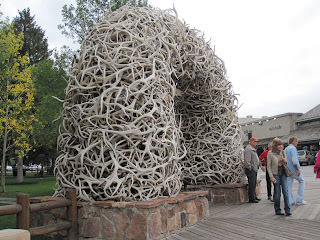 There were four of these antlered archways at each corner of the downtown plaza. 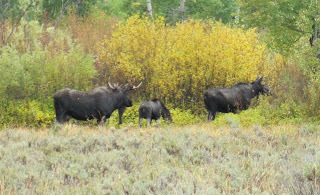 We encountered this family moose unit on our way through the park. But, of course, it's all about the food! JC emailed a friend of his whose son used to live in Jackson and he recommended a place for lunch. It was a BBQ restaurant that is a favorite of the locals and the prices weren't bad for a ski resort town. 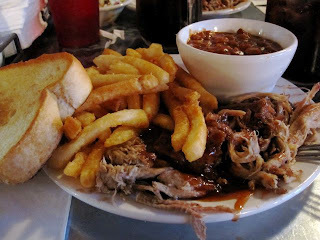 We both had the pulled pork lunch plate with a choice of sides. 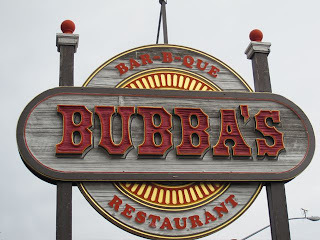 Bubba's (515 W. Broadway, Jackson, WY 83001) good barbeque and sides with prices that won't break the bank - don't miss it if you are in the area!! Bring on the barbeque!! That food looked great, and the antler sculptures were very "artistic"! i thought they were kinda creepy! Yummy, Yummy . . . NOMS!!!! !